The OHM Natural flavor has more in common with the Blue than the Bold. 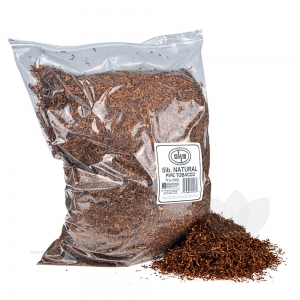 It's a smoother, less harsh tobacco that limits the flavorings used to deliver a more traditional and natural taste. OHM pipe tobacco is a medium cut, strong pipe tobacco that limits shake and stems using an intricate filtering procedure prior to packaging. This method ensures that every bag, no matter the size is perfectly mixed and flavored to deliver an unmatched experience. 5 lbs.of one of the best quality tobaccos I have tried. This bag is not vacuum packed so if you are looking to store it, you will need to transfer it to a better package. I put up 2 lbs. in gallon glass jars and the other 3 lbs will pack over 6 cartons after bringing the moisture content up a bit. No dirt, minimal "stems", and just a nice run through my Powermatic1. The smoothest "natural" smoke I have made so far. I will buy this again. Ohm Natural Pipe tobacco is great!!! It is consistantly clean of twigs and brush, works really good in my machine and tastes awesome! Excellent tobacco, with a fairly coarse cut. Does not seem any wider of a cut but perhaps longer and more intact in the bag. Perfect for my Powermatic II and would also be good for any auger fed machine. Less dust than some other brands but still fairly dry shipping weight, you likely get more than the flavored tobaccos because of the blended humicants in them. Taste is a little smoother than the golden harvest perhaps because of the tobacco selection, seems like a little more of the Virginia's than Turkish tobacco's. or maybe it is just packaged a little fresher. Tastes more like a Winston or Kent than say a Camel or Chesterfied, a little less harsh without the lingering aftertaste some harsher brands have. If you want an additive free tobacco and enjoy a more refined full flavored smoke than look no farther, this is good stuff. Just a little kudos to the website, best prices I have found and excellent selection of tobacco's and tubes. Love the deals at Tobacco General. Thanks to them found and love the OHM brand. The OHM Natural is alittle dryer in moisture that the other OHM tobaccos. There are some fine shreds and fine particles but I'm able to intergrate it into the cigarettes using my Powermatic. It might be dryer because it doesn't have all the additives other tobaccos have. To me this is a good smooth tasting tobacco with no after-taste. Reminds me of Winston cigarettes. I love being able to buy the OHM brand in the 5 pound size. After trying the OHM Natural others in my family are also buying these "money-saving" 5 pounders.